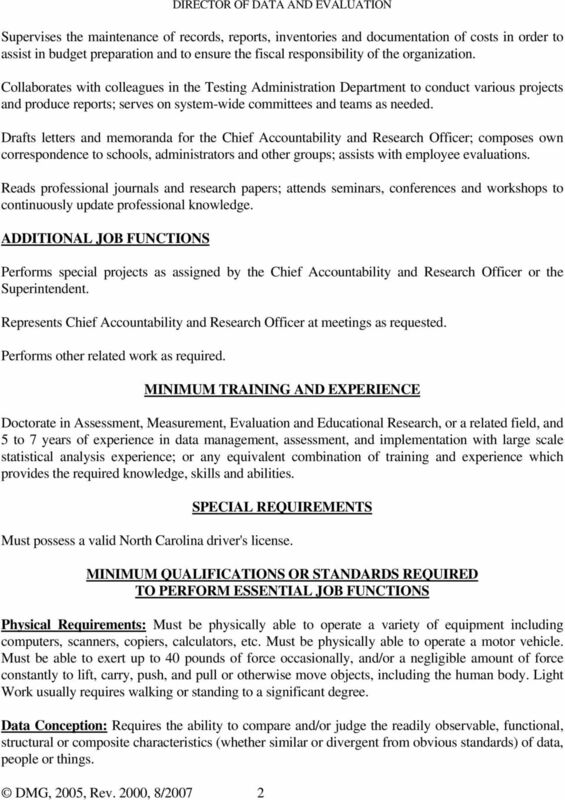 Download "GUILFORD COUNTY SCHOOLS JOB DESCRIPTION JOB TITLE: DIRECTOR OF DATA AND EVALUATION"
1 GUILFORD COUNTY SCHOOLS JOB DESCRIPTION JOB TITLE: DIRECTOR OF DATA AND EVALUATION DMG, 1994, Rev. 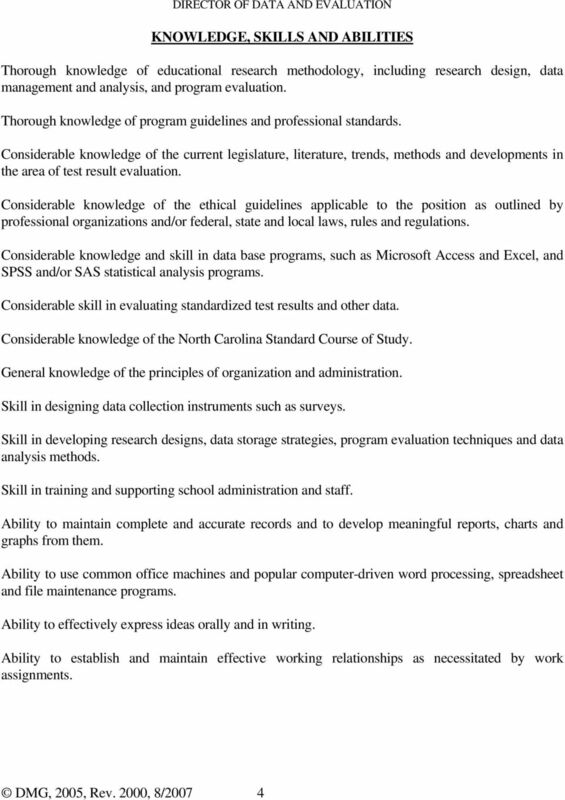 2000, 8/07 1 GENERAL STATEMENT OF JOB Under limited supervision, performs a variety of technical and administrative tasks in directing the testing data collection, management, analysis, and program evaluation. Employee provides departmental leadership, and is responsible for managing large data gathering and processing projects, preparing state mandated testing data accurately and in a timely manner, analyzing the testing data, and then linking the results to curriculum, instruction and assessment. Employee coordinates and serves schools testing data collection and management for the school system. Employee supervises subordinate evaluation specialist, data analyst, and grant writer. Employee performs program evaluation, as well as special projects at the request of Chief Accountability and Research Officer. This director reports to the Chief Accountability and Research Officer. ESSENTIAL JOB FUNCTIONS SPECIFIC DUTIES AND RESPONSIBILITIES Designs testing data-collection strategies; collects and/or assembles data; identify an appropriate way to guarantee the accuracy of the data; finish data verification procedure; complete internal AYP and ABCs evaluation in a timely manner so the Data and Evaluation department and schools can have enough time working together to correct any errors if it exist and verify the results before state deadline. Also, identifies and applies appropriate statistical analysis, produces graphical, tabular and narrative summaries of data and statistical analysis results; writes testing reports and executive summaries. Provides professional consulting services for school system staff and administration. Also, provides advice and technical assistance to schools in testing data collection and data analysis; provides guidance on appropriate psychometric practices and methods of displaying data; provides technical support and goal summary report to schools on time to interpret the test results; links results to curriculum, instruction and assessment. 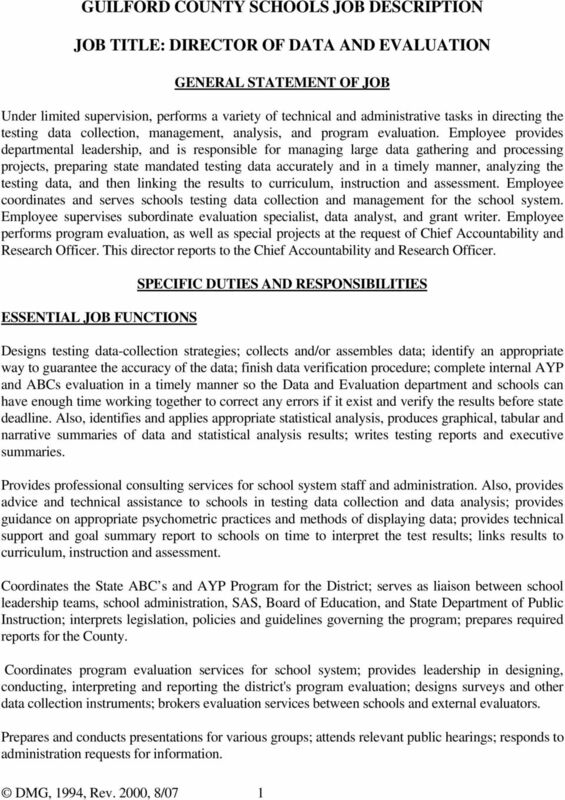 Coordinates the State ABC s and AYP Program for the District; serves as liaison between school leadership teams, school administration, SAS, Board of Education, and State Department of Public Instruction; interprets legislation, policies and guidelines governing the program; prepares required reports for the County. Coordinates program evaluation services for school system; provides leadership in designing, conducting, interpreting and reporting the district's program evaluation; designs surveys and other data collection instruments; brokers evaluation services between schools and external evaluators. Prepares and conducts presentations for various groups; attends relevant public hearings; responds to administration requests for information. 2 DMG, 2005, Rev. 2000, 8/ DIRECTOR OF DATA AND EVALUATION Supervises the maintenance of records, reports, inventories and documentation of costs in order to assist in budget preparation and to ensure the fiscal responsibility of the organization. Collaborates with colleagues in the Testing Administration Department to conduct various projects and produce reports; serves on system-wide committees and teams as needed. Drafts letters and memoranda for the Chief Accountability and Research Officer; composes own correspondence to schools, administrators and other groups; assists with employee evaluations. Reads professional journals and research papers; attends seminars, conferences and workshops to continuously update professional knowledge. ADDITIONAL JOB FUNCTIONS Performs special projects as assigned by the Chief Accountability and Research Officer or the Superintendent. Represents Chief Accountability and Research Officer at meetings as requested. Performs other related work as required. MINIMUM TRAINING AND EXPERIENCE Doctorate in Assessment, Measurement, Evaluation and Educational Research, or a related field, and 5 to 7 years of experience in data management, assessment, and implementation with large scale statistical analysis experience; or any equivalent combination of training and experience which provides the required knowledge, skills and abilities. SPECIAL REQUIREMENTS Must possess a valid North Carolina driver's license. 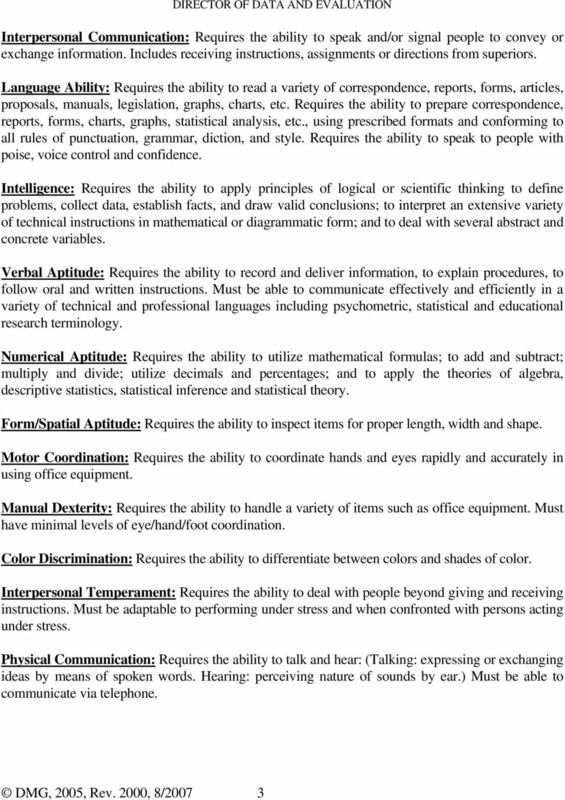 MINIMUM QUALIFICATIONS OR STANDARDS REQUIRED TO PERFORM ESSENTIAL JOB FUNCTIONS Physical Requirements: Must be physically able to operate a variety of equipment including computers, scanners, copiers, calculators, etc. Must be physically able to operate a motor vehicle. Must be able to exert up to 40 pounds of force occasionally, and/or a negligible amount of force constantly to lift, carry, push, and pull or otherwise move objects, including the human body. Light Work usually requires walking or standing to a significant degree. Data Conception: Requires the ability to compare and/or judge the readily observable, functional, structural or composite characteristics (whether similar or divergent from obvious standards) of data, people or things.